The man who heads the US Department of Entropy has been at the helm for just over a year. I kind of like Dr. Moniz as he is a larger than life Alfred E Neuman. This wiki links talks to Dr. Moniz’s accomplishments. 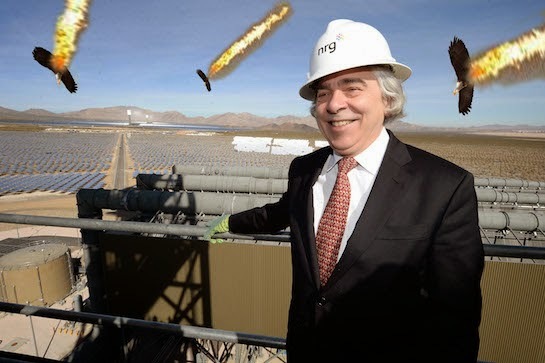 Dr. Moniz posts on Facebook all the fluffy good news on energy that the Obama Administration wants us to see. He is the face of the administration for the Obama swing away from coal to greener energy. Unfortunately for Dr. Moniz his results have been about as good as that of the Veteran’s Affairs Secretary and the Whitehouse Press Secretary. Dr. Moniz has overseen the first increase in CO2 emissions in the US in years. As much as he quicksteps to renewable energy coal power generation is coming back based on marginal generation costs. Yeah the man who brought us the BLOOMDOGGLE in California is now worried about coal boondoggles abroad. Mr. Huffman I suggest you call Dr. Moniz and ask him about the “coal boondoggle” going on right here in this country. Mr. Huffman is running a little scared now that I have told him that the California Public Utilities Commission (CPUC) put an end to Huffman’s Assembly Bill 864 in Sacramento after the CPUC determined that in 2010 too much SGIP money was going to Bloom Energy. I quote from Scott Murtishaw the subject matter expert at CPUC on the SGIP who wrote this in an email to me on May 22, 2014. OK we now have the CPUC agreeing that Huffman’s AB 864 was a Bloomdoggle. I have to say if we were not headed to total economic and ecologic disaster reading Mad Government would be as funny as reading “what me worry”. But we simply cannot afford the incompetence of Dr. Moniz and the hypocrisy of Mr. Huffman. Perhaps Ernie and Jared could follow Eric and Jay example and disappear. Some high school logic Ernie is to Eric as Jarod is to Jay. Did AT&T and or Mr. Darius Anderson lobby him to introduce AB 864? And why did he and the CPUC have such different views on AB 864? I know Mr. Huffman fears the Green Machine so I told him to bring 10 of his staff, 10 of his supporters, and 10 reporters from the Santa Rosa Press Democrat (Darius Anderson’s newspaper) and all I will bring is a recorder to record the answers to the two question listed above. Of course like Jay Carney, Jared Huffman is bobbing and weaving and blaming it on Bush and the GOP. I simply can’t wait for Mr. Huffman and 30 others on his side get to tell us all what went on Sacramento to give Bloom Energy $257 million of ratepayers’ money under the SGIP BLOOMDOGGLE. Maybe to Jared SGIP stood for Send Gore Increased Payments? To me SGIP stands for State Government Is Pathetic. Several readers have asked me to further explain the ethane as a transportation fuel idea. I came up with a simple analogy. Ethane (C2H6) is Ethanol (C2H5OH) minus one oxygen atom. Getting rid of the oxygen atom makes Ethane higher proof ethanol. What do I mean by higher proof? Ethane yields 20,630 BTUs per pound when combusted in an engine and exhausted as CO2 and water vapor. Ethanol only yields 11,587 BTUs per pound when combusted in the same way. Ethanol is already partially oxidized as it already has one carbon oxygen bond. When combustion occurs in a fuel the fuel is oxidized. Full combustion means full oxidation. Ethanol is a poorer fuel because it starts off partially oxidized ns hence cannot yield as much heat of combustion as it non oxidized two carbon sibling Ethane. Hence one can think of ethane as higher proof booze. Performing all the algebraic equations to solve the problem of how to yield one million BTUs of energy from fuels via combustion, I established the following: To yield one million BTUs of heat from ethanol 165.1 pounds of Carbon Dioxide will result. To yield the same one million BTUs of heat from ethane only 142.2 pounds of Carbon Dioxide will result in the simple act of combustion. Ethane is therefore the greener fuel than Ethanol aboard the vehicle. Folks may argue that Ethane is a fossil fuel and that Ethanol is bio-derived but aboard the vehicle the ethane yields less CO2 out of the tailpipe for the same amount of energy than does ethanol. The proof of alcohol is a crazy measure. In the USA it is twice the percentage of alcohol by volume in the booze bottle. In the UK it is 7 times divided by 4 the percentage of alcohol by volume in the booze bottle. The proof of ethane is yet to be defined and I intend to prove it as a transportation fuel by real demonstration. We are looking good in the MIT competition for a proposed method to lower carbon emissions in transportation. The link below is where you need to go to support the proposal if you have not done so already. It is pretty likely we will be invited to present the idea later in the year to the competition committee. Unfortunately for those of us who like Whiskey, while ethane only has a wholesale price of approximately 30 cents a gallon and is 200% proof, it will simply asphyxiate one not intoxicate or inebriate one. 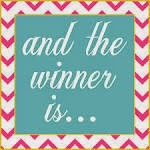 My last blog solicited quite a bit of interest. 99% of the emails I received were positive. Only one naysayer. The naysayer was involved in several failed biofuel and hydrogen ventures. He also was a big proponent of KIOR the failed pine tree to diesel alchemic fake out I have so often blogged about. Hence I kind of dismissed his negativity as sour grapes and jealousy. The hurdles to getting Ethane to fuel tanks of trains, trucks, and cars are large but are simply logistical hurdles. With sufficient will and the involvement of dedicated people and organizations it can be done. It does not need government subsidy it simply needs infrastructure. I took a look at Ethylene’s thermodynamic properties a couple days ago as I thought it too may have the right properties like ethane and propane to be a liquid fuel under moderate pressure and room temperature. Surprisingly the critical temperature of ethylene is much lower than ethane. Ethylene has a critical temperature of 9.2 degrees C and ethane is 32.17 degrees C. Unfortunately for ethylene, if the ambient temperature is higher than the critical temperature the gas will not condense into liquid phase and as room temperature is around 20 degrees C ethylene will not be stored like ethane and propane and is not a candidate for the Green Machines Idea. Also ethylene has only two hydrogen atoms for each carbon atom and therefore does not have a carbon intensity lower than gasoline. Bye bye ethylene!! 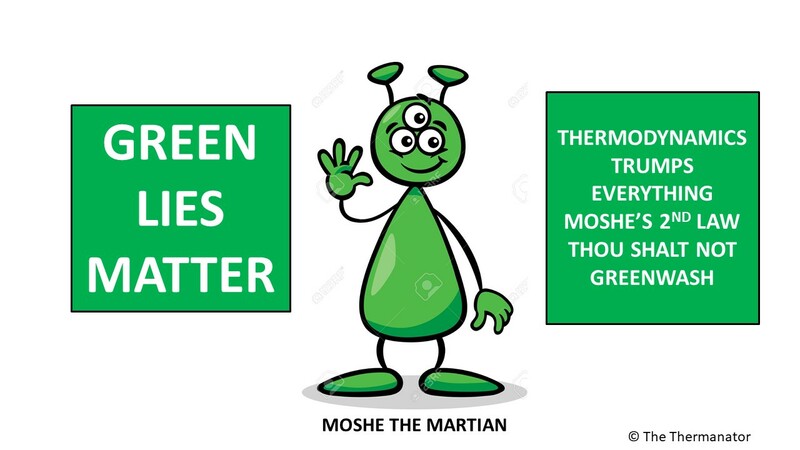 For the above reasons as well as cost reasons, Ethane is still the Green Machine’s first choice of the new low carbon, inexpensive, high range liquid transportation fuel. It simply cannot be beat for simplicity, economics, range, and improved lower carbon emissions. The next steps for my ethane proposal other than to become a finalist in the MIT competition is to get a demonstration program going of this promising fuel. I can tell you all I am working on that. Talking of the MIT competition for those of you who have not yet supported the idea here is the link to do that. We already have 24 supporters and are leading the competition. On the KIOR front they announced their first quarter results and the Green Press like Biofuels Digest are now in the Green Machine’s camp that KIOR is on final life support from Vinod Khosla and his adviser Condi Rice. The missing weapons of mass combustion may simply never be found. Ethane is the anti-KIOR. Ethane obeys the laws of thermo while KIOR is the third strike for Vinod Khosla (Range and Cello were his other two strikes). I just hope that a real promising idea of ethane as a transportation fuel can get a small fraction of the $604,859,000 KIOR has wasted so far on their alchemy. I probably need less than one million dollars to make ethane a reality. Wow had Vinod and Condi called the Green Machine before they set out on the fake out, I could have saved $604,859,000 from being burned. Ethane trades for approximately 28 cents a gallon. $604,859,000 will buy 2.16 billion gallons of ethane. I just need to do a demonstration of perhaps 50,000 gallons to show the viability of ethane as a transportation fuel. Before I end this blog I have to say KIOR is not the worst example of lost money in the bio fools arena the title goes to Amyris who have lost $821 million on the far not seen fake out. KIOR will go bust before they get to last place as Vinod and the Province of Alberta Canada won’t pour another $217 million dollars down the KIOR drain. Remember I told you all that KIOR in Hebrew was the wash basin sink at the entrance to the temple in Jerusalem. Condi and Vinod may have to turn to selling holy water made from pine trees after they give up on diesel and gasoline. Other big losers in the Bio Fool space are Solazyme with losses of $340,998,000, Gevo with losses of $272,996,000 and Codexis with losses of $263,234,000. The five bio fools listed above collectively have lost over $2.3 billion. Add the Oh Bummer money given to these fools and this makes Solyndra look like a success story. By the way Vinod Khosla had a hand in Amyris and Gevo as well. Look at the stock charts below. Vinod is very consistent. The world is looking for a lower carbon intensive liquid fuel for transportation. The massive logistical hassles of liquefying, transporting, and storing natural gas (methane) have made this fuel hardly available for motorists and truckers even after many years of effort and the massive amount of dollars invested. Converting gas to liquids through chemical synthesis is very wasteful of the energy content of the natural gas and is also extremely capital intensive. As an example we should consider Shell Oil with their massively cost overrun Qatar Pearl GTL Project and their now abandoned GTL project in Louisiana that are linked below. Lindsay Leveen The Green Machine (CTO of ITZ A GAZ Inc. Tiburon, CA) has formulated a simple yet elegant solution for a USA sourced liquid fuel that is economic, is less carbon intensive than gasoline or diesel, and is still widely available with the fuel actually is in large surplus. This fuel is ethane (C2H6). Yes ethane is the step sister of the other natural gas liquids propane and butane. It is also the step sister of methane in pipelined natural gas. There are limits to the quantity of ethane that can be sold in pipeline natural gas. The shale gas revolution in the USA has brought about vast coproduction of ethane with natural gas. The USA is actually swimming in ethane. Companies are planning ethane crackers to convert ethane to ethylene and ethylene’s petrochemical derivatives such as polyethylene and PVC. More plastics are not what the world needs! Other companies are lining up to cryogenically liquefy and transport ethane to far off lands in Europe and Asia in specialty LNG type cryogenically refrigerated ships. This is also a waste of our ethane resource and an expensive and non-green option to deal with the glut of ethane. The Green Machine proposes to simply compress ethane to a sufficient yet fairly low pressure at which it liquefies at room temperature. Yes in a welding tank in an auto shop or an oxygen tank you see at a hospital, ethane will become a liquefied gas at moderate and safe pressure. Ethane like carbon dioxide, propane, and butane are all stored as liquid in those gas cylinders. The basic welding cylinder is 90% filled with liquid ethane. By storing the ethane fuel as a liquid under pressure, many more BTUS of fuel can be stored in the same volume of cylinder compared with CNG. Compared with LNG there is much less logistical and infrastructure hassle in the supply chain to get the liquid ethane fuel aboard a vehicle. Ethane is a really good fuel on a gaseous per cubic foot basis and has 70% more BTUs per scf than methane. It is also clean burning and low in sulfur like methane. The Green Machine estimates that only 3% of the energy content of the ethane will be lost to compress it into liquid state in a gas cylinder. For the same size gas cylinder the ethane powered vehicle will travel more than twice the range of a similarly equipped CNG vehicle. The ethane powered vehicle will emit less CO2 per mile than a gasoline fueled vehicle as ethane is less carbon intensive and richer in hydrogen than gasoline (3 hydrogen atoms for each carbon atom in ethane versus only 2 to 1 in gasoline). Companies are considering projects to covert ethane gas to liquids by reforming the gas and then synthesizing methanol, DME, gasoline, or diesel from the synthesis gas produced in the reforming. This is massively capital intensive and wastes over half of the energy content of the gas with large amounts of CO2 being emitted due to the low efficiency of the gas to liquids synthesis process. The Green Machine is suggesting a national energy policy for the USA that adds ethane directly as liquid ethane into the transportation fuel mix. Railroad locomotives are a first target for the proposed ethane fueling conversion. Railroads have investigated and considered LNG but the logistics and costs of a cryogenic fuel are simply too high. It is very simple and easy for a train to have several tube trailers of ethane on flat bed carriages behind the locomotive that supply the ethane fuel to the locomotive for the long haul propulsion of trains. For shunting and rail-yard work the locomotive could easily be fueled from a single tube trailer on a carriage behind the locomotive. If the Green Machine Ethane Idea is adopted it is quite possible that as much as a quarter million barrels a day of surplus ethane that is now being reinjected or flared could compliment the gasoline and diesel the USA uses in transportation. This is about 2% of the total gallons of transport fuel other than jet airplane fuel that is consumed in the US on a daily basis. Note a gallon of ethane has approximately half the fuel content of a gallon of diesel. Hence two gallons of ethane will substitute for one gallon of diesel. All that is needed is for larger companies to join the ethane bandwagon. No government subsidy is needed as liquid ethane is only worth about 30 cents a gallon (at its trading point in Mont Belvieu Texas) and when expressed on a diesel equivalent basis this is only 60 cents a gallon of diesel equivalent. There is a lot of value add to pay for the logistics of compression and hauling of ethane to get it aboard cars, trucks, and trains. To the right is a photo of a jumbo tube trailer that will hold approximately 5,200 gallons of liquid ethane or 2,600 gallons equivalent of diesel. A diesel locomotive typically has a similar quantity of diesel in its storage tank. Lindsay Leveen is the recipient of the 2011 Professional Development Award from the Northern California Section of the American Institute of Chemical Engineers. 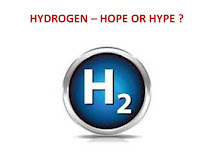 He also wrote the primer on energy and sustainability titled Hydrogen Hope or Hype? and is available as an Ebook. Kimberly King an Energy and Sustainability Engineer and Lindsay Leveen have submitted the ethane transportation fuel idea to the Climate Colab at the MIT Center for Collective Intelligence. If you like the idea please hit the “support proposal” tab on the link below. Researchers at AT&T Bell Labs in New Jersey invented a solar cell 60 years ago. This was 6 years and a few months after Bell Labs invented the first working transistor. The post world war two period till the late 1950s were the wonder years of physics in America. Even Pontiacs and Oldsmobiles were wonderful then. Bell Labs and New Jersey were the epicenter of amazing discoveries and practical inventions. Thermodynamics and quantum physics were the basis for the research. The BS of the past ten years where junk science, greenwashing, and the department of entropy taking over labs would have never been tolerated in that golden period of science based research. Harry Truman was president when the transistor was invented. We just celebrated his 130 Birthday. Harry was from the Show Me State. Now the state of research conducted has become the Show Me The Money State. The US was simply an amazing place to be in 1954 when the first solar cell was invented. No person living then would have believed that the Communists in China would be making most of the solar cells sixty years later and the US would have Companies like Solyndra that would be shellacked by the grandchildren of the peoples’ liberation army. It is simply a disgrace that Dr. Chu headed the Department of Energy and took it onto the train to nowhere. The fantastic thing about solar cells is they can be a clean competitive source for generating electricity on a large scale. The project I worked on in the Atacama Desert of Chile is one example. That project made economic and ecologic sense and is dispatching 100 megawatts of electrical energy into the grid day in and day out. The next frontier in making solar energy fully dispatchable is to store energy on a grid scale. This can be done with natural gas fired systems that provide spinning reserves and ancillary services. There is also significant effort to store energy in batteries that back up the grid. I have a hunch that there will be breakthroughs in the battery systems that do allow certain PV and wind power projects to become more economic. I have blogged about the number of cycles lithium ion batteries may enjoy. There are other chemistries that also may do the job here. The best thing we can all do is let chemists, physicists, and engineers do the R&D and let the laws of thermodynamics either prove or disprove their inventions. Dr. Moniz who now heads the DOE would do well to simply let private industry fight it out on energy storage and let the best technology win without choosing (Chu-sing) sides. Dr. Chu was completely derelict in his duty to choose the wrong chemistry in PV and have the US get its head handed to it by China. The US has the ability to use natural gas in conjunction with PV and Wind generation. Therefore let the batteries compete on a level and unbiased playing field with natural gas to see which way the intermittency of PV and Wind power generation can best be levelled out. If natural gas is the way to go we should use natural gas. If a certain best battery is the way to go we should use that battery. If pumped hydro or compressed air storage is the way to go we should use those technologies. What we should not do is pump billions of tax payers’ dollars into the hands of bundlers and political operatives to solve the problem. 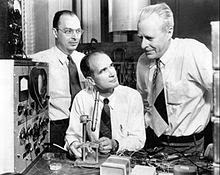 Bravo Bell Labs for inventing the transistor and the solar cell. The Chileans in the Atacama are enjoying the benefits of electrons thanks to your science. I promised I would post the link for DELMARVA customers to complain to their Public Service Commission for the overcharge on natural gas in BLOOMDOGGLE by Bloom Energy. DELMARVA has been billing for more than the permitted amount of natural gas for electrical energy from the Bloom Energy Servers at Brookside and Red Lion. The maximum permitted quantity of natural gas is 6.6 million BTU per mwh and DELMARVA has billed as high as 7.19 million BTU per mwh. This is an overbilling to all of DELMARVA’s customers. We have no involvement in DSG's air permitting process with DNREC. Emission permitting issues are between DSG and DNREC. Delmarva and DSG are both required to comply with the QFCP Tariff, however. There are heat rate provisions in the Tariff, and DSG has operated within those heat rate Tariff provisions. Delmarva's obligations are well established within the terms of the QFCP legislation and the Tariff. We will continue to comply with those obligations. Taking the actions that your email requests would constitute a violation of both the QFCP legislation and the QFCP Tariff. I suggest 200,000 DELMARVA customers all fill out the complaint form. This may light some natural gas under the DE PSC. Inside EVs reports that sales of electric vehicles in the USA are up by 21.8% for the first four months of the year compared with 2013. 30,580 plug ins were sold in January through April 2014 versus 25,101 in the first four months of last year. I had predicted 140,000 plug ins would be sold in the USA in 2014 but my prediction may be a little too high. I had thought the Volt and the Tesla S would sell better than they have. In fact sales of both of these models are down year on year. The sales of the Tesla S have dropped from 7,000 to 4,900 per Inside EVs and the sales of the Chev Volt have dropped from 5,550 to 5,154 units in the first four months of each respective year. This is an ominous sign of market saturation for these models. The Nissan Leaf has grown sales at the expense of the Volt and the Model S. 7,272 Nissan leafs were sold in the first four months of 2014 versus 5,476 last year. Ford and Toyota have also gained market share in the plug in space. What is ominous for the battery suppliers is that the Fords and the Toyotas have far smaller battery packs and the total quantity of kilowatt hours of battery packs aboard plug in vehicles sold so far in the USA in 2014 is probably less than or equal to the total kwh of battery packs sold in the same period last year. This means the market for battery packs in the plug in vehicles has already matured. This foretells of an invalid business plan with the proposed Giga Battery Factory Tesla is planning to build. As an example the plug in Prius that has seen sales grow well this year (5,037 units versus 2,952 units last year) only has 4.4 kilowatt hours of battery pack versus 85 kwh for the Tesla S. There were 2,100 fewer Model Ss sold in 2014 meaning 178,500 fewer kwh of battery packs. Only 9,382 kwh of extra battery packs were needed for the 2,085 additional Prius Plug Ins sold in 2014. The shift away from growth in the total amount of kwh of battery packs is actually a good thing as the lithium is being shared among more motorists and the total emissions of all plug ins is being improved. It never made much ecological sense for the few Tesla Model S owners to hog the lithium. More auto companies are offering plug in hybrids and the path ahead for Tesla is going to be even more competitive. From a green perspective I am all for the sharing the lithium among the maximum number of motorists to lower the collective CO2 emissions by the largest amount. Bravo to Toyota and Ford for doing this.